This entry was posted in "Scraps" Projects, Quilting, Quilts: Pieced & Applique and tagged Aurifil Mako 50 Cotton Thread, Aurifil Subtle Strings Thread Collection, Bird Quilt, Fall Houston Quilt Market 2015, Feather quilting, Wendy Sheppard Designs. Bookmark the permalink. ← Flying…. and a totally pointless This or That! You just blow me away with your quilts. I have been quilting for 35 years and can’t begin to do these types of things. Something is just inborn in you I guess. 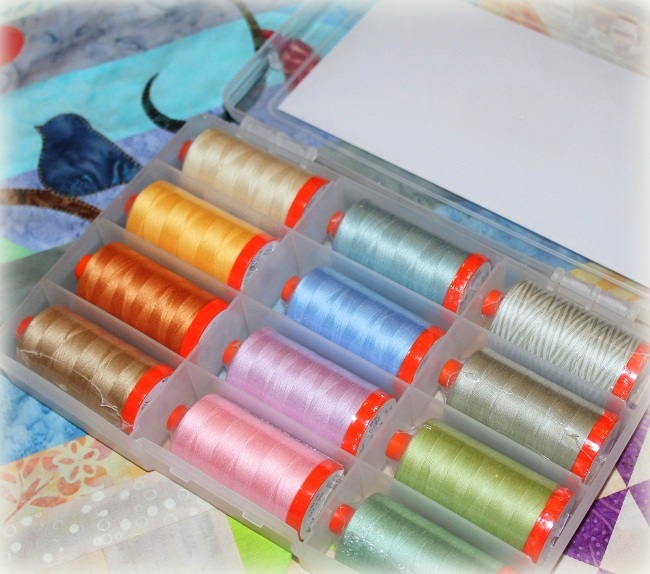 Your thread collection is gorgeous! Is the pattern for this quilt available? Just adorable! I am in awe, almost speechless, but not quite. What a beautiful little quilt! You seriously raised the bar with this design and quilting. 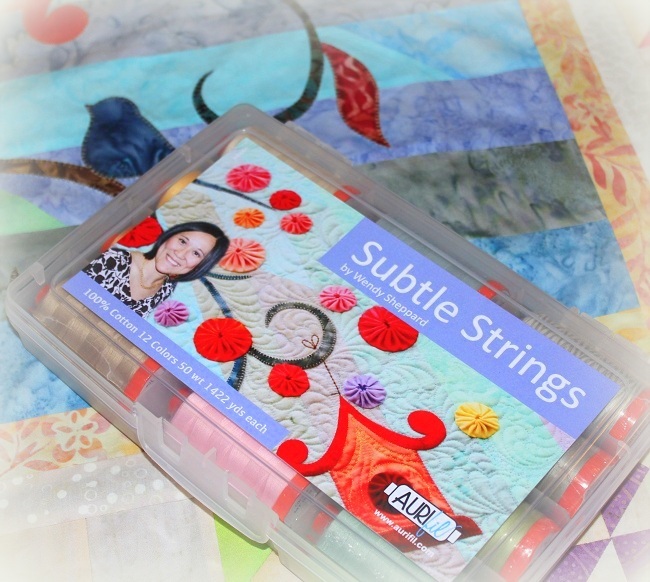 I am a beginner FMQer, and I am finally at the stage where I’m beginning to absorb talk about needles and threads and not feel overwhelmed. I learned so much from this post! 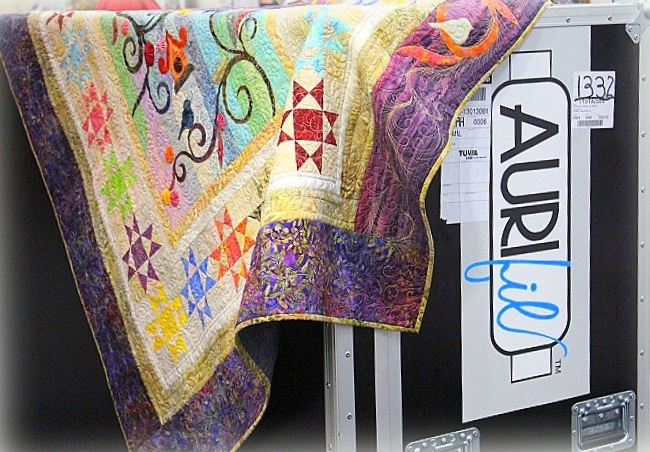 Aurifil had an amazing display and your little quilt was certainly a highlight! Your quilt immediately made me smile – it’s so pretty and such a happy quilt design. And, as usual, your quilting is extraordinary. 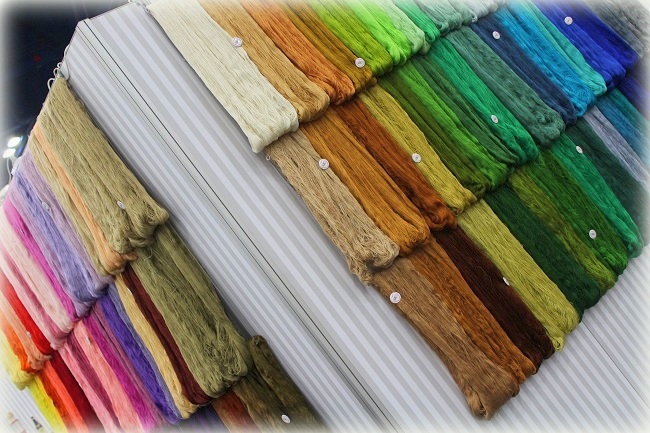 Oh, how I love the colours in your box of threads – that’s a fabulously useful group of colours!! Wendy, your quilt and quilting are spectacular! Congratulations on your success! What fun! 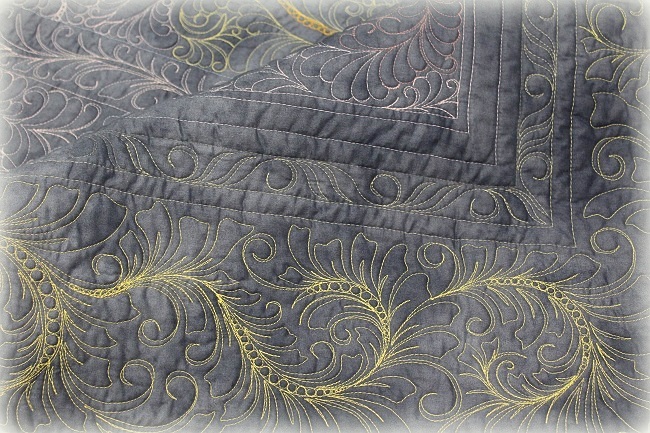 Love the fabrics and subtle quilt thread colors as well as your always lovely quilting. Just beautiful! I wish i had been there! It’s on my bucket list. 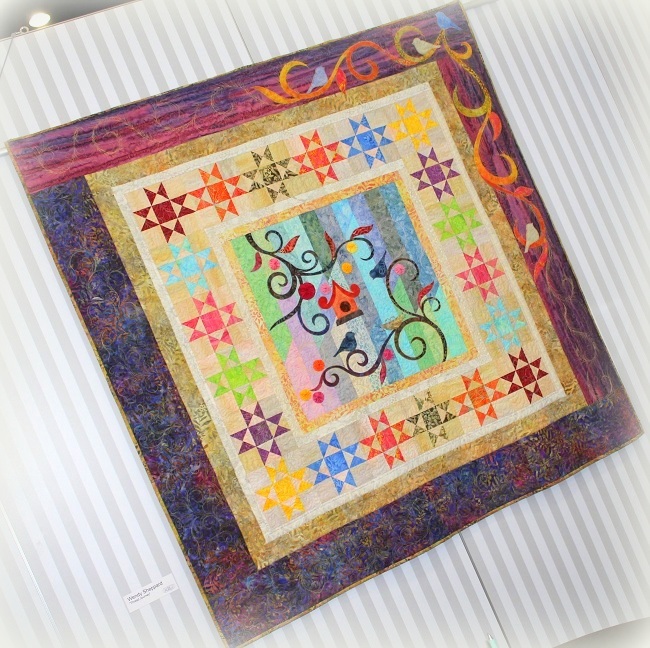 Congratulations on your own thread collection as well as having your quilt displayed with Aurifil. 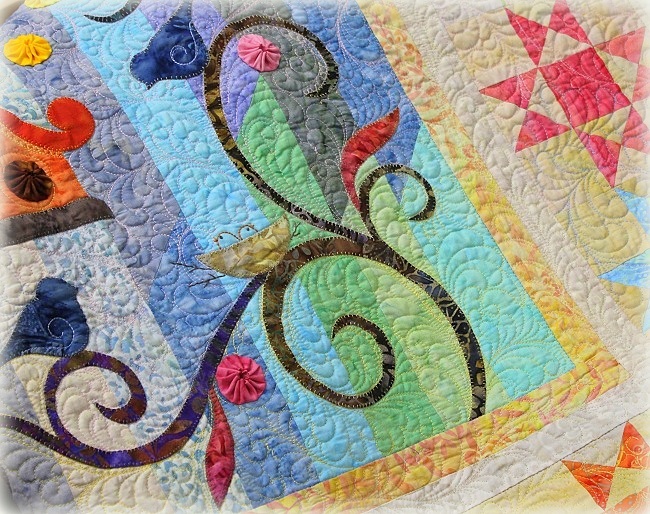 I love the mix of piecing and applique along with the yo-yos. Your quilt is absolutely gorgeous. Total #CreativeGoodness. And I think your pictures of this quilt and others all came out great. Thanks for sharing. 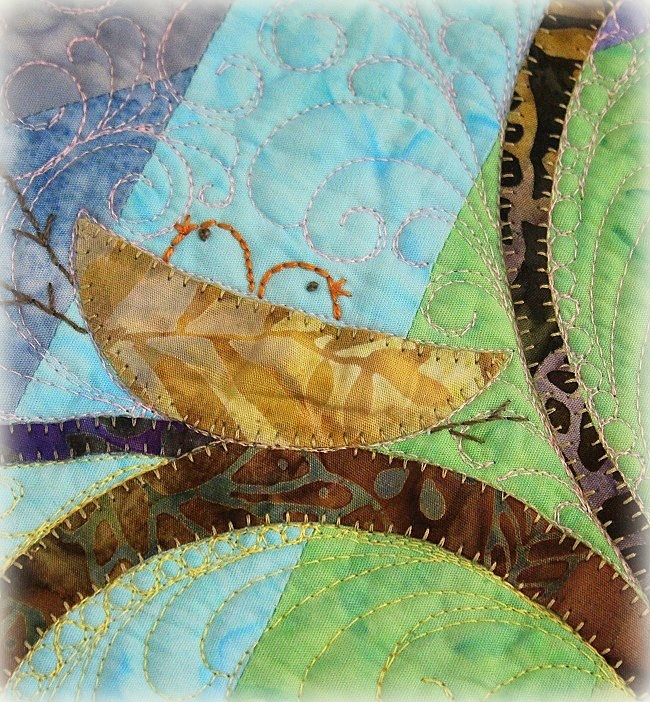 Have a good trip to Annie’s Quilt Festival. So glad you had a good time at market. 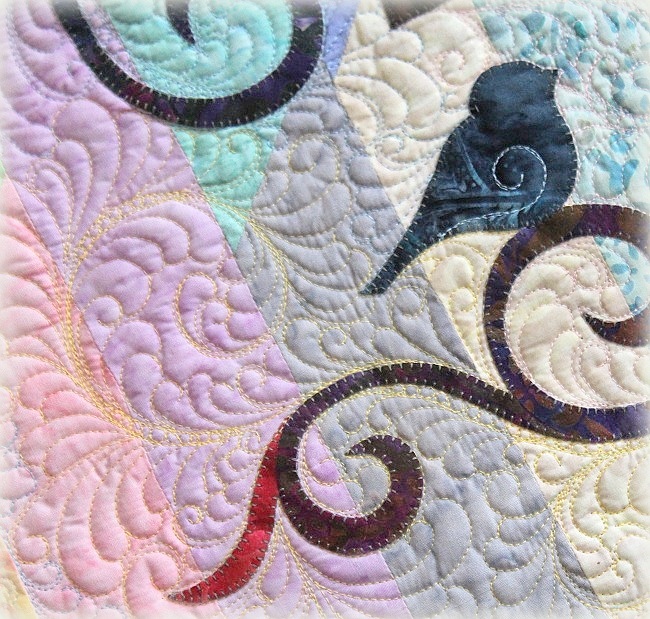 Love the latest quilt with the little bird. Your little birds make me smile. Such a delightfully pretty quilt! I really like the way you used so many different colored threads to quilt this; it really adds so much extra interest. Congrats for being chosen by Aurifil. Plus having your own thread collection as well. I know they chose the right quilt and you to have these honors! You are an amazingly talented quilter. Have a wonderful creative day! Nice thread collection. Beautiful quilt. Thanks for sharing it with us. The quilting is amazing as usual. : ) Many blessings on your next adventure. 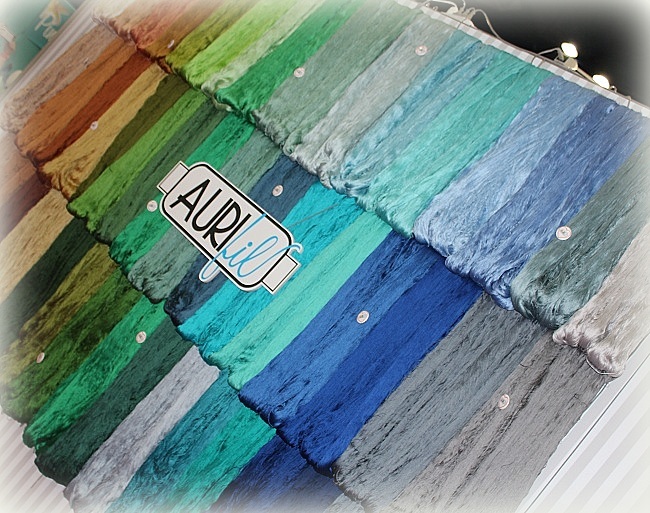 The Aurifil booth is heavenly! Thanks so much for showing the back of the quilt! The front is beautiful, and as someone that quilts my own quilts, seeing the back of the quilt is always a thrill too! At our guild’s Machine Quilting Bee our show & share is never complete until we flip the quilts over to check out the backs! Just checked into my hotel for Festival and will be up bright & early for a class tomorrow! 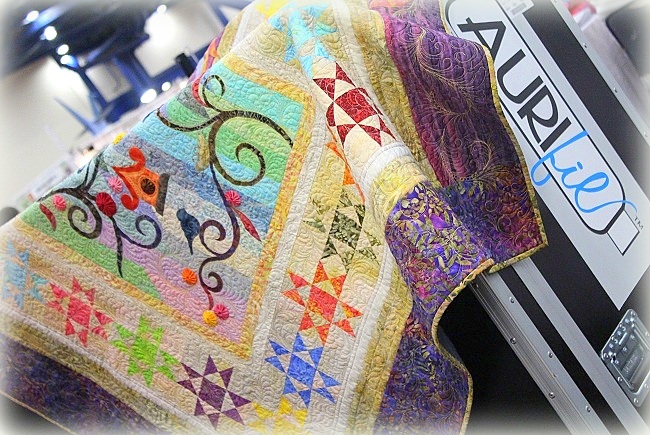 I’ll definitely be stopping at the Aurifil booth for your gorgeous collection! That is beautiful. Thanks for the pictures…very inspirational. I love this quilt so much. Lucky you got to go byebye. I am sure Miss Baby missed you. Gorgeous, I love your quilt. I hope you get some time to relax before you get started on your next project. I adore your quilt! I hope you had a great time. Wendy, your quilt is lovely and the quilting is magnificent, as always! Those Aurifil threads look yummy! Oh my, definitely a “Wendy” quilt. It is gorgeous. I love the design with the swirls and birds and stars. Colors are beautiful, threads are awesome. What else can I say? I Love it!!!!! Sounds like you had a great adventure at Market. Off to another adventure, how exciting!! how nice that you can reap the rewards of your efforts……. enjoy. Lots of Hugs…………. 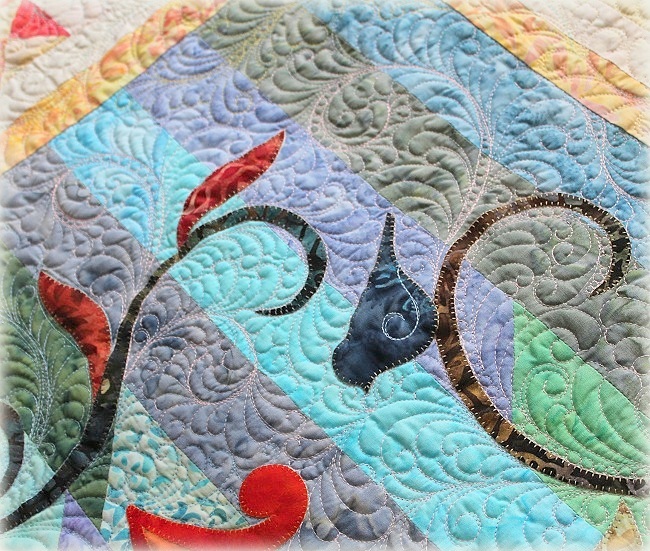 beautiful Quilt-I just love your quilting and although I do free hand quilting I have never been able to replicate patterns-like you can. I must need more practice. What fun displays of thread and your quilt. Glad you had a good trip! 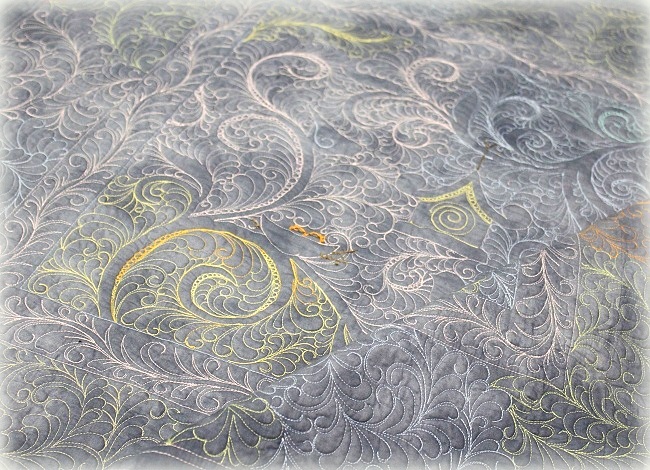 Your quilt is nothing short of gorgeous ….and the quilting……….well, exquisite doesn’t even begin to describe how beautiful the entire creation appears. 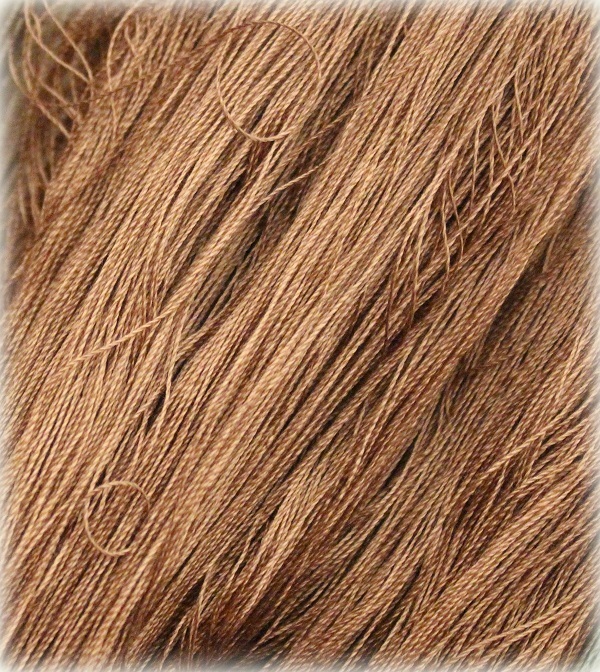 Color choice of both fabric and thread is a visual celebration. I am FMQ feathers in the border of a queen-sized quilt on my Mom’s old Bernina 930. I have two newer machines, both good and reliable, but the Bernina is my go-to workhorse. First, it was sentimental; then it became very apparent that the very best stitches are made by my 25+ year old Bernina. My goal is to make my feathers as beautiful as yours are. Your work is an inspiration; thank you for sharing. It is beautiful. I hope you enjoy your time in Houston Wendy!. sooooooooo happy to see you at Market my sweet friend!